If you like outdoor furniture that looks like it's been left out in the garden—for decades, perhaps—then you just might find it at an antique store. While antique stores used to be the first go-to place for all things vintage, flea markets, online auction sites, and sources like Craigslist have put many antique stores out of business. But nothing beats seeing the real thing in person. Come along on a visit to a couple of antique stores in Southern California for a look at some amazing outdoor relics from the past. You won't be the only one on the prowl for vintage patio furniture and a good deal on a one-of-a-kind or rare find. Many antique malls report frequent visits by bloggers, photographers, and set designers from film and TV studios. See the real thing in person—you never know what's in store! 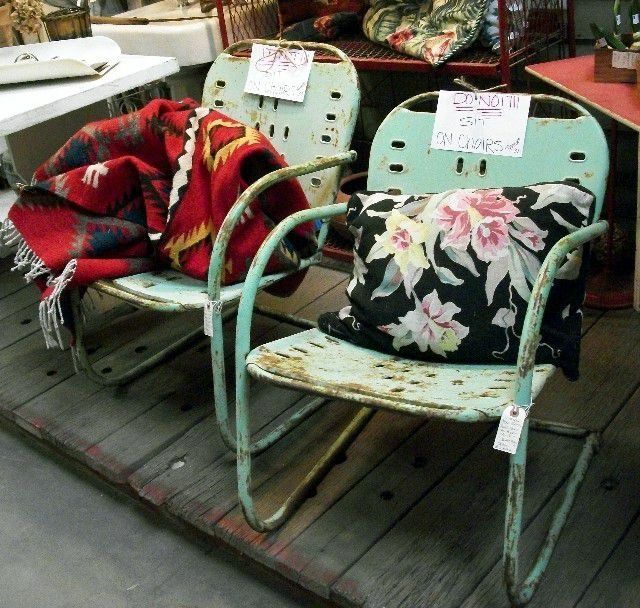 The thing about metal chairs like this pair is that, whether they are authentically vintage or reproductions, they will eventually rust and chip. Give them a few years, and you may not be able to tell the difference. These particular chairs are authentically old—you can tell by the shape, design, punched-metal pattern, etc. Newer ones—considered "retro"—are usually more solid and are powder-coated in contemporary colors, like brighter reds, yellows, and dark greens. Depending on how much more you want them to weather, chairs like these would probably be better off if they were on a porch or undercover—rain and the elements will just give them an extra layer of rust. Two wide-eyed children are forever cast in cement, ready to sit on someone's lawn or in the garden. During the mid-20th century, cement and concrete-cast lawn ornaments and garden statuary were all the rage. In the Northeastern United States, you might still find lawns with statuary and ornaments, like gnomes, kissing frogs on benches under umbrellas, mushrooms, deer, geese, mirrored gazing balls, and other earthly delights. If you have a front porch, you have to have a glider. Preferably, the older or more unique-looking, the better. This curving metal glider for two was probably made in the late 1940s or 1950s, and is the kind that would make a noise every time you glide back and forth in it. After hiding behind walls and fortresses for many years, front porches and porch furniture—like gliders—are making a comeback. People are starting to enjoy the old-fashioned benefits of rocking on the front porch in the evening, watching neighbors walk or drive by. While these may look like vintage Adirondack chairs, they aren't true Adirondacks, and are likely a DIY project from days gone by. How can we tell? The back of the chair looks like a portion of a wooden picket fence, and is not as smoothly contoured or angled as an authentic Adirondack. That's not to say these chairs don't have charm. Back in the days before do-it-yourself was an actual term and a badge of honor, our fathers, grandfathers, and great-grandfathers would get ahold of some chair-makin' instructions from a handyman's how-to book or magazine and whip up one of these fine-looking garden chairs over a weekend. Guys back then had skills—either learned from their relatives or woodshop class. It's just what you did and there was no social media to capture it. Sometimes the seat part of an outdoor chair can get worn out or broken down. That's where something like this comes in. Adding lightweight potted plants covers up worn seat areas, serves as a warning for guests not to sit there, repurposes an old garden chair, and simply looks charming. Yes—that's a vintage red truck right behind the white chair! Two-seat gliders used to be popular for relaxing on the front porch on warm summer evenings. Single-seat gliders were a bit more unusual or maybe haven't survived the years. Like the two-seaters, this green metal glider chair has the same "spring" and rhythmic gliding action and still looks good after all these decades. Although this two-seat settee is reminiscent of Adirondack-style furniture, it's simply a homemade wood patio chair project from many decades ago. Adirondack or not, it is still charming and has loads of character—perfect for the garden, patio, porch, or any place in the yard. Throw on some homemade pillows in indoor / outdoor fabric, and you have a cozy, inviting place to relax.